This was taken on a bike tour I did on a fresh sunny day, some time in spring 2010. I just picked up an old Miranda 50mm prime so I could use my Pentax film camera again, and went westwards of Glasgow, cycling along Dumbarton Road, where this photo was taken. I really like this photo, despite a few imperfections, because it captures the spirit of the tour rather nicely. 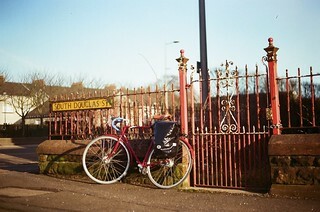 The colours are vivid and yet, due to the use of film, look a bit old-fashioned, in line with the style of the bike. The lone bike, with no one around, also symbolizes the freedom that comes with going on a cycling tour, even if its just for a day, as with this one. Oh, and if you see this bike, let me know. It's been stolen shortly after.